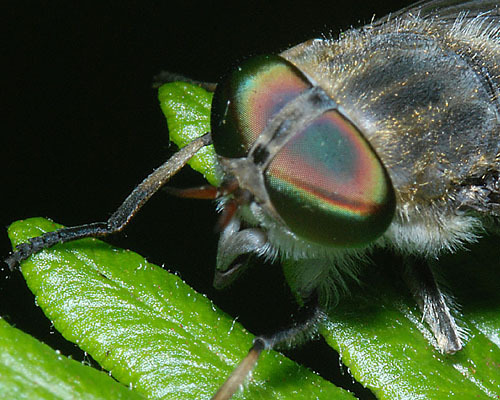 Tabanus maculicornis is a rather small, dark species with a body length of 12-13 mm. The female has three rows of whitish abdominal triangles clearly shown in the first image below. The sublateral spots on tergites 2 and 3 are oblique and stop well short of the front margins of these segments. Tabanus maculicornis has a wide light grey supraoccipital border of the head, behind the upper margin if the eyes (see first picture below). 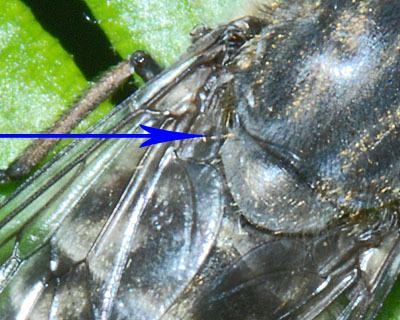 The English name of the species ("Narrow-winged horsefly") refers to the narrow alula (the wing cell indicated by the blue arrow in the second picture above) at the posterior base of the wing. This distinguishes Tabanus maculicornis from Tabanus bromius, which has a broad alula. The eyes of the female in life (shown below) are green, often with a coppery sheen, and with a single purple band which becomes less distinct towards the inner and outer margins. The antennae are orange (see below) which distinguishes Tabanus maculicornis from Tabanus bromius, which has the antennae mainly dark. As with the female, the male Tabanus maculicornis (not pictured here) has the abdominal markings whiter than in Tabanus bromius. The eyes in life are green with a broad purple band at the junction of the different sized facets. In Britain Tabanus maculicornis is widely distributed as far north as Perthshire, although most records come from the south of England. It is less common than Tabanus bromius with which it often flies. It is found throughout Europe and into Russia and the Transcaucasus. 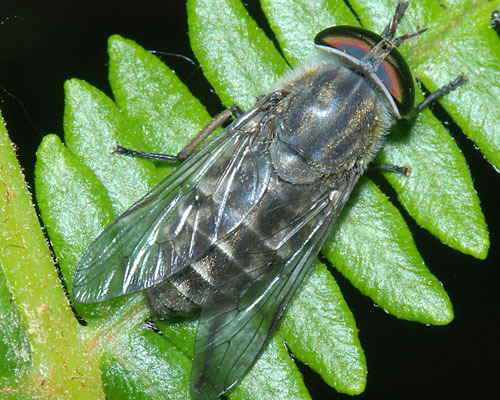 The narrow-winged horse fly flies in wooded areas with streams from mid-May to mid-July, markedly earlier than other Tabanus species. Krčmar & Leclercq (1999) used hand nets to collect tabanids from grazing cattle in Lonjsko Nature Park in Croatia. They found that Tabanus maculicornis and Tabanus bromius were the two commonest species, comprising over 70% of the tabanids caught. Krčmar & Maríc (2006) found that when Tabanus maculicornis fed on humans, the preferred feeding was the lower leg, the same as Tabanus bromius. Kniepert (1980) found that only 2.2% of female Tabanus maculicornis had fresh or digested blood in the midgut (n = 646), whilst 84% had taken nectar (n=351). Oldroyd (1939) cited workers from Europe finding larvae in boggy soil and in moss on a low-lying meadows. In Croatia Krčmar et al. (2005) showed that 1-octen-3-ol and aged horse urine are very effective attractants for Tabanus maculicornis. Krčmar et al. (2006) compared the response of tabanids to different natural attractants. Aged cow, horse, sheep and pig urine all gave greatly increased catches in a canopy trap relative to an unbaited trap, with aged cow urine performing better than the other attractants. Krčmar (2007) caught 16 Tabanus maculicornis in a trap baited with 4-methylphenol (one of the active chemicals in cow urine), but none in an unbaited trap. Oldroyd, H. (1939). Brachycera. In: F.W. Edwards et al. British blood-sucking flies. British Museum (Nat. Hist. ), London.